Buy vs Rent Software: What’s Best for Your Business? If you’re an entrepreneur, it’s a dream: saving enough time and money in your small-business operations that you can afford to go on vacation. Like, for a whole week… maybe even to a tropical island with palm trees. It’s not an impossible dream. One way small businesses are saving money is by looking at their capital and operational expenses and considering whether it’s better to buy or rent what their firm needs. An expenditure that can live in either the Capex or Opex column is software. If you buy a software license, it’s considered a capital expense—one that won’t be fully tax-deductible the year it was purchased. Or you can opt to rent your software on a monthly basis. That means it’s an operating expense and can be fully deducted. Adobe, Microsoft, Intuit, and Autodesk are examples of companies offering rental licenses for their software. And tax savings are not the only benefit. You’ll incur lower upfront costs by accessing software via a rental license. Renting also gives you the flexibility and savings of adding or removing software seats when you need to, and you can potentially pass along costs to clients. 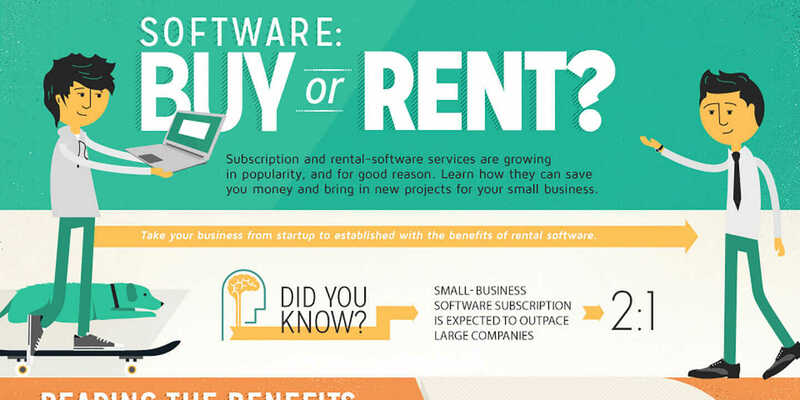 The infographic, below shows what your small business can gain from renting software. Were you worried that forgoing “ownership” of your software would mean relinquishing control? Far from it. Renting software also means that upgrades are included, and oftentimes, you’ll get better tech support. The bottom line: Save money to use elsewhere in your small business, or pay yourself that deferred salary you deserve and go drink some piña coladas on the beach. Have you tried renting software for your small business? How has it worked for you? Please tell us about it in a comment below.